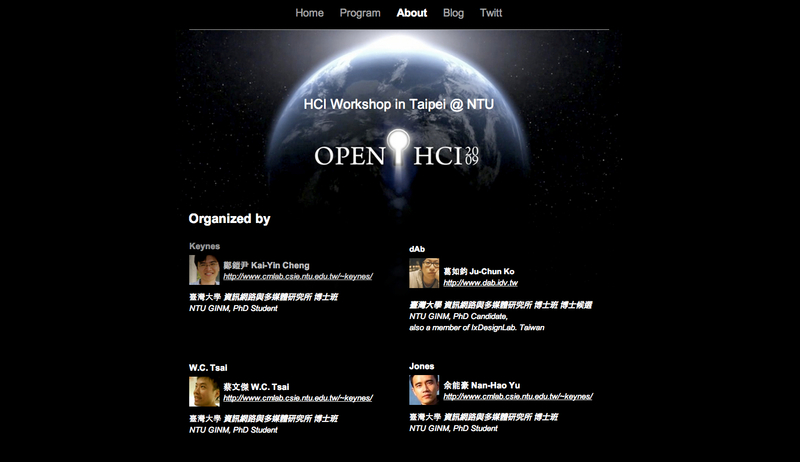 OpenHCI is the workshop on HCI held in National Taiwan University. This workshop was initiated and organized by graduate students of National Taiwan University and National Taiwan University of Science and Technology. The main purposes of this workshop are opening the potential power of cross-disciplinary communication and collaboration and the preliminary knowledge of user experience engineering (UXE) and human-centered design (HCD). More than 500 students has join this event. Attendees are from different domains such as information engineering, industrial design, psychology, business, and administration. In this 5~6 days workshop, all attendees have tutorials and courses about HCI design processes and principles in different topics. We also develop a series of post-lesson activities and labs for attendees to familiar these principles by practices. Through the complete training, all the attendees would experience several user-centered design iterations, collaborate with their cross-domain partners, and implement interactive prototypes for realizing their concepts.